An epic document of the life and work of Martin Luther King, Jr., from the 1955 Montgomery bus boycott to his assassination in 1968. Rare footage of King's speeches, protests, and arrests are interspersed with scenes of other high-profile supporters and opponents of the cause, punctuated by heartfelt testimonials by some of Hollywood's biggest stars. 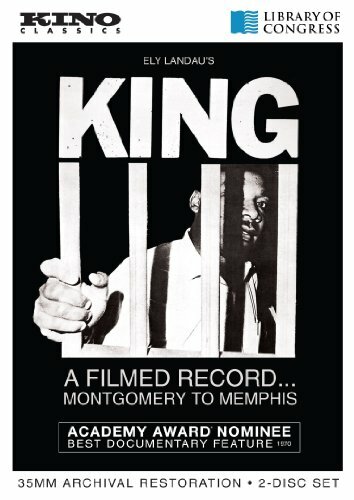 New York, NY - January 8, 2013 - Kino Classics is proud to announce the DVD release of the landmark documentary, King: A Filmed Record... From Montgomery to Memphis . Constructed from a wealth of archival footage, King: A Filmed Record... From Montgomery to Memphis is a monumental documentary that follows Dr. Martin Luther King, Jr. from 1955 to 1968, in his rise from regional activist to world-renowned leader of the Civil Rights movement. This documentary comes to DVD in a 2-disc set from Kino Classics in a version newly restored by the Library of Congress, in association with Richard Kaplan, and utilizing film elements provided by the Museum of Modern Art. The street date is January 15, 2013, with a SRP of $34.95. Produced for the Martin Luther King, Jr. Foundation by Ely Landau (The American Film Theater collection), King is an epic document of the life and work of Martin Luther King, Jr., from the 1955 Montgomery bus boycott to his assassination in 1968. Rare footage of King's speeches, protests, and arrests are interspersed with scenes of other high-profile supporters and opponents of the cause, punctuated by heartfelt testimonials by some of Hollywood's biggest stars. Both a historiography of the non-violent, civil rights movement and a portrait of the movement's inspiring leader, King is comprised of original footage captured during those turbulent years. "The events are allowed to speak for themselves," wrote The New York Times' Ellen Holly. "The roar of police motorcycles, bombs, burning crosses, ambulances, gospel, shouts, the massed crowds before the Lincoln Memorial at the 1963 March on Washington, and, most thrilling of all, the speeches of the man himself." Without any voice-over narration, King uses contemporary film/newsreel and video/television footage to brilliantly convey the boiling indignation of an oppressed people and their revolutionary organizing. Juxtaposed over this footage are dramatic readings by actors Harry Belafonte, Ruby Dee, Ben Gazzara, Charlton Heston, James Earl Jones, Burt Lancaster, Paul Newman, Anthony Quinn, Clarence Williams III and Joanne Woodward. These sections were co-directed by Sidney Lumet and Joseph L. Mankiewicz. King: A Filmed Record... From Montgomery to Memphis premiered as a special "one-time-only event" on March 24, 1970 in over 600 theaters throughout the United States. The film, three hours in length, was billed as "An Evening in Tribute to Martin Luther King." A critical success, King was nominated in 1970 for an Academy Award in the Best Documentary Feature category, and raised over three million dollars for the benefit of the Martin Luther King, Jr. Special Fund. A shorter version of the film was subsequently made available to TV stations across the globe, but the original, unedited, three-hour version of the film, has rarely been shown in recent years. Newly restored by the Library of Congress, in association with Richard Kaplan, and utilizing film elements provided by The Museum of Modern Art, the original version of King can again be seen in its entirety, mastered in HD from the 35mm preservation negative.